General Motors’ announcement of $5.4 billion for U.S. plant changes includes money which will help the company build vehicles out of lightweight materials, company representatives said Thursday. GM is being tight-lipped about what most of the $5.4 billion over three years would buy, but it did provide some insight into where $783.5 million would go at three Michigan facilities — including applications for lightweight, strong substances like aluminum. “Two out of the three would have some play there (advanced materials),” GM manufacturing and labor spokesman Bill Grotz said. The $139.5 million announced for a new body shop and upgraded stamping at Warren, Mich., Pre-Production Operations certainly could benefit the company’s lightweighting efforts, according to Grotz. “They use a number of advanced materials as well,” Grotz said. For example, he said, the plant worked with the Detroit-Hamtramck GM plant on the mixed-materials Cadillac CT6, which has 13 different metals and alloys and is 64 percent aluminum. Flint, Mich., GM operations spokesman Tom Wickham wrote in an email that the money for Warren “will allow us to do more with steel, aluminum and other materials,” though he wouldn’t elaborate further. $113 million this year will go to add another 164,000 square feet to the body shop, according to a fact sheet Wickham provided about the spending on the 900,000-square-foot Warren plant. “The expansion will allow for the addition of new equipment to support both aluminum and steel vehicle body assemblies,” the document states. The shop will receive technology for robotic framing and roller hemming, underbody subassembly, and laser welding. Another $26.5 million this year will pay for more stamping capability at the plant’s South Campus through two bridge cranes, two presses and two five-axis mills, according to the fact sheet. The document says the center works with manufacturing and product engineers to “build the first, fully functional versions of new and next-generation vehicles.” “Core Teams” from assembly plants visit to learn how the vehicles are built and help optimize the actual production. $124 million planned for the Pontiac Metal Center would include buying a secondary tryout press able to test aluminum dies, according to Grotz and WJBK. Grotz said it could test mild steel as well, but he wasn’t sure about high-strength steel. All major body panel dies will be tested at the Pontiac plant in the future. Another $520 million will be spent at the Lansing Delta Township factory for equipment and tooling for new vehicles there. 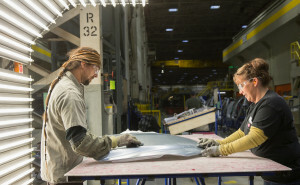 “These investments are evidence of a company on the move, strategically investing in the people, tools and equipment to produce cars, trucks and crossovers that are built to win in the marketplace, with stunning design, quality and breakthrough technologies,” North America President Alan Batey said at Pontiac, according to GM. We’ll learn what else GM is buying with the other $4.6 billion later this year, the company said. We wouldn’t be surprised to see more lightweighting initiatives — which can translate into more complicated vehicles to repair — supported by the money, similar to what Ford will spend on carbon fiber research and Jaguar will pay for more aluminum manufacturing capability.